I was overjoyed to visit Stockholm and home of the Nobel Prizes which are awarded in a ceremony each year at the Stockholm Concert Hall, as this was an item on my Bucket List. To cross off my list that I had seen the Nobel Prize “up close and personal” would have been a first for me, as most of my bucket items to cross off are non-travel related so far. I had previously read the biography of Albert Nobel and was very excited to know I would be walking the same halls that countless distinguished and accomplished award winners had previously walked. You need to know that Stockholm has a lot of construction going on – just about every corner you turn there is a building being demolished and replaced, or new construction, or some type of building resurfacing – we encountered the latter when we passed by the Concert Hall, so actually didn’t get to go inside and tour the building. Big disappointment and I will just have to schedule another trip to Stockholm in the future! Now onto the food…..I make bite-size swedish meatballs as an appetizer when I have guests, so since we were in Sweden it seemed logical to order Swedish Meatballs, no? Well they don’t make ’em tiny – they are gargantuan, roly-poly big guys – which is actually okay, because they tasted fabulous! 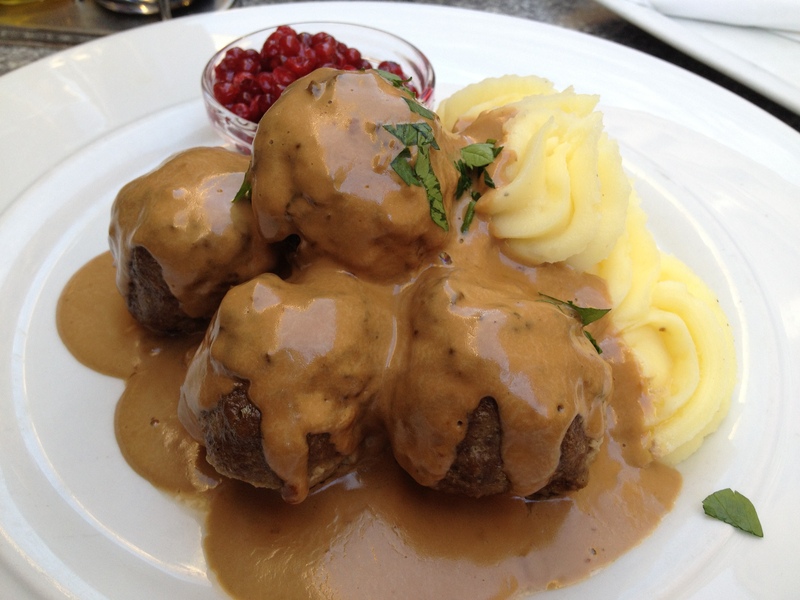 ENTREE – “Swedish Meatballs with Lingonberry Sauce” served with creamy garlic mashed potatoes. I have had Lingonberry Jam (a Scandinavian staple) a few times before here in the PNW. This sauce had a sweet-tart tangy punch to it which complemented the meatballs nicely. And we enjoyed eating on the patio at a lovely outdoor bistro and feel the pulse of Stockholm as locals and tourists alike roamed the area. 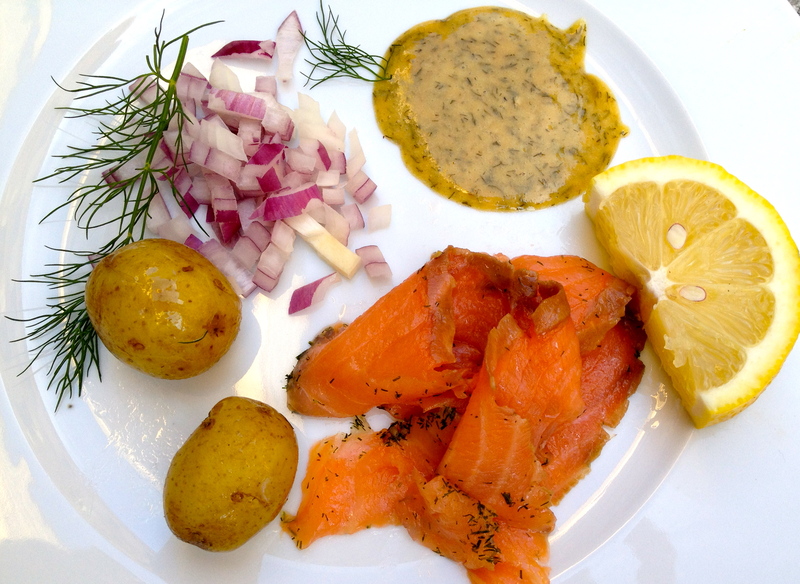 APPETIZER – “Fresh Smoked Salmon with Grainy Brown Mustard” served with white new potatoes and condiments. It’s always disappointing when you visit and can’t get into a building, isn’t it? Big Ben was getting a facelift when we were there, lol… but you got to have those yummy meatballs and with a lingonberry sauce which I’ve yet to find here!! Lucky you! Isn’t that the truth? Yes the meatballs and lingonberry sauce were delightful. Although I can get lingonberry jam/sauce here pretty readily I can also go online and get it from Amazon.com (I have used both the Felix brand and also the IKEA brand – both were very good). Too bad you couldn’t get in the building but those meatballs and lingonberry sauce sound divine!! Stockholm is lovely! Yes Stockholm is very beautful and the people were very friendly! Hey Joy – recipes once again after my travel posts – two more to go! Looking forward to tomorrow. Thanks John! Although I am Italian and Irish and long for more authentic Italian restaurants here, I am lucky to live in a large population of Scandinavians and can find the appropriate ingredients quite easily to make some of their fine dishes. I now it sounds simplistic, but I LOVE Swedish Pancakes on the weekends! Previous PostIs this any way to run a cruise line?